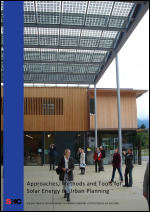 This report gathers and presents approaches, methods and tools that can support and facilitate daylight and solar energy considerations within urban planning processes. The report presents different ways to address existing building stock, new urban environments and landscape environments in relation to use of daylight and active solar. It addresses the need for spatial and energy planning that enhances solar energy while respecting cultural and historical heritage values in urban and landscape contexts.